for newly underwater world of digital full high-definition. 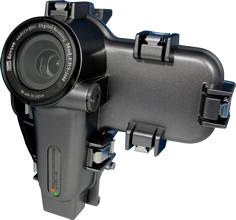 Underwater housing for Xacti VPC-CG100/CG20 full high def digital movie camera!! The excellent technology and function is shown under water by our newly introduced Epoque underwater Digital camera housing EHS-1400. You can enjoy with this housing with Full high-Def. digital movie photography as well as digital camera. For enjoying the wonderful underwater world with Wide/Macro lens, Underwater light, external strobe and others can be attached.